An Actionable Plan for a Sustainable Future... 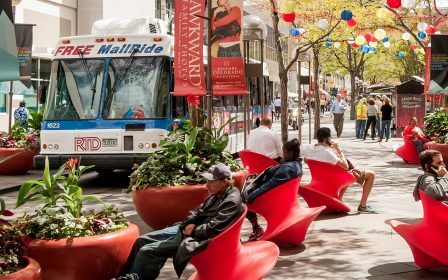 The 16th Street Mall is in need of repair and an actionable plan for a sustainable future, and equipped with an impressive collection of data and information, the Downtown Denver Partnership is stewarding key next steps to sustain its great legacy. The 16th Street Mall is now 35 years old, and was originally designed for a life-span of 30 years. As its infrastructure continues to deteriorate, we are seeing and feeling the need for a clear plan for its future. 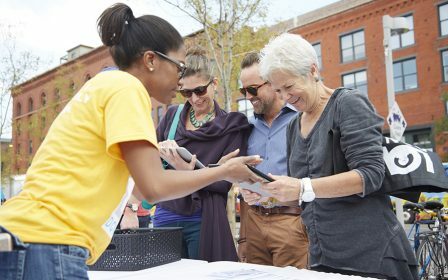 Throughout the Mall’s lifecycle, the Downtown Denver Partnership has embarked on a strategic and coordinated effort to inform how we steward its successful future. This has included the 2008 Urban Land Institute study, the 2009 Technical Assessment and Rehabilitation Study, the 2010 16th Street Urban Design Plan, and The Mall Experience study which has given us a better understanding of the holistic user experience on the Mall. Mall partners, including the City and County of Denver and RTD, are currently working on an environmental process to determine the future of the 16th Street Mall, which could result in a plan for reconfiguration to optimize the 1.2-mile corridor that is used for transit, pedestrians, retail and leisure activities. The City and County of Denver and the Regional Transportation District (RTD) are recommending a design for reconstruction of the 16th Street Mall that would expand sidewalks for walking, café seating and other activities, and move transit lanes to the center or offset-center of each block. These updates are designed to enhance the Mall experience for visitors while improving pedestrian safety and mobility on the city’s most transit-rich street. The proposed design would update and modernize the Mall’s deteriorating infrastructure, while honoring its iconic look. 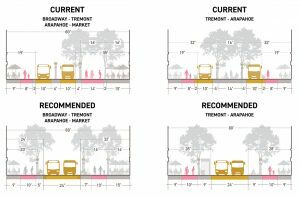 The recommended alignment will improve safety for pedestrians by offering wider pedestrian zones, trees and historic lights as new visual and physical buffers between bus lanes and sidewalks, and fewer points where buses and pedestrians must cross paths. “The 16th Street Mall is Denver’s Main Street, serving millions of people each year. We are proud to have worked with our Mall partners and stakeholders to develop a clear recommendation for its sustainable and successful future,” said Tami Door, president and CEO of the Downtown Denver Partnership. The recommended design honors the iconic look of the Mall. It will retain the street’s patterned “carpet,” originally designed by landscape architect Laurie D. Olin of Hanna/Olin and architect Henry N. Cobb of I. M. Pei & Partners to evoke a Navajo blanket and the floor of the Pantheon. The recommended design includes more trees than exist on the Mall today, with a goal to expand the tree canopy in line with the 2017 Outdoor Downtown Plan for parks and public spaces. The project is currently undergoing a National Environmental Policy Act (NEPA) review and a cultural resources evaluation pursuant to Section 106 of the National Historic Preservation Act of 1966 (NHPA). This environmental process provides the opportunity to build on the unique history of the Mall, and its important role as a transit and pedestrian corridor and public space, in order to deliver a successful experience for the next 35 years and beyond. The NEPA process is expected to wrap up in December 2018. Final design planning will continue after NEPA is complete, if the “No Build” option is not selected. If approved, project would repair infrastructure, enhance the Mall experience for all users. Construction likely to begin in 2020. As the recipient of federal funding, the future of the Mall must comply with an environmental process as outlined by the National Environmental Policy Act (NEPA). The process could result in a plan for reconfiguration to optimize the 1.2-mile corridor that is used for transit, pedestrians, retail and leisure activities. Opportunities for the community to engage in the planning processes for the 16th Street Mall, including open houses and opportunities for public comment, will be posted to our Community Engagement section of the events calendar.